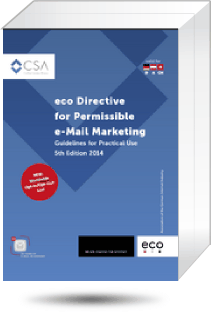 The online marketing competence group of eco – Association of the German Internet Industry – just published their 5th edition of the popular “eco Directive for Permissible Email Marketing – Guidelines for Practical Use”. As you might know, the German email landscape is special in several ways. For instance, three local email providers own about 75% of market shares for consumer email addresses. It’s not Hotmail, Gmail, Yahoo! 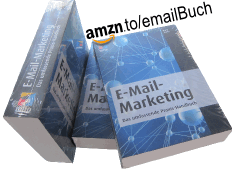 Mail or AOL – but GMX, Web.de and T-Online. Second, the association of the German Internet Industry (eco, representing ISPs) and the Dialogue Marketing Association (DDV, representing bulk mailers) joined forces in 2005 to launch the so called Certified Senders Alliance (CSA, about) – a central bulk mailer whitelist. Rechtsanwalt Sven Karge, Fachbereichsleiter Content bei der Initiative Anti-Spam des eco Verbands äußerte sich in Nico Zorns E-Mail-Marketing-Blog unter anderem zu den Plänen der Certified Senders Alliance (CSA), der zentralen Positivliste (“Whitelist”) für E-Mail-Versender im deutschsprachigen Raum. Was gibt’s Neues zum geplanten Sender++-Logo (siehe vorangegangener Artikel)? (Für wann) Ist eine Ausweitung der Positivliste auf weitere (internationale) ISPs, wie z.B. AOL geplant?